The aconites are back! They are not in my garden you understand, they just don’t take, maybe the pheasants eat them, but that doesn’t matter now, because they are back in the valley. There is a spot, nestled into a large bank at the side of the road, where I see them. They are tucked amongst the ivies and harts tongue ferns, nestled in the thin chalky soil at the feet of the horse chestnuts and beeches, amongst the scrub and brambles. I don’t know how many there are. It is a dense group, and the size of a large garden pond, perhaps only 3 metres or so in diameter, but that is enough. 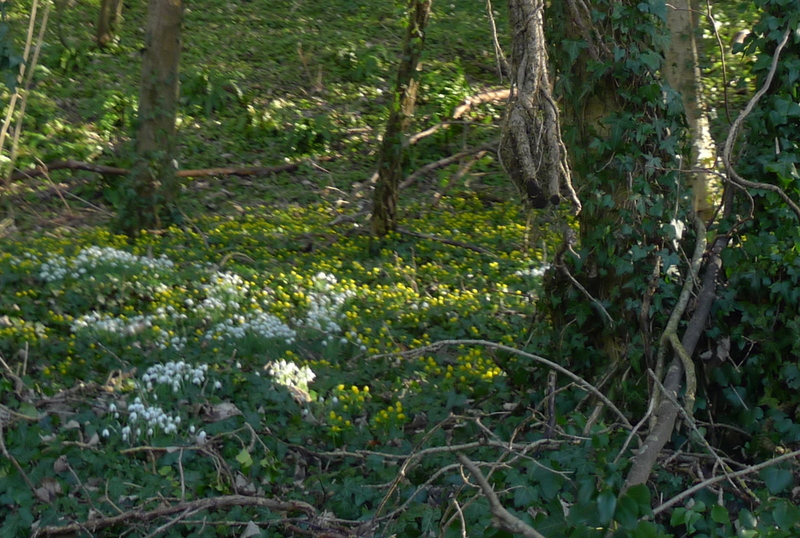 There are many patches of snow drops along the roadside, and very nice they are too. They flower from New Year until well into February, and they are thoroughly appreciated. But the aconites are special. I’m not sure what they are doing there, in such a wild tangled place. Maybe they are escapees, although where from isn’t terribly clear. Perhaps some foresighted soul scrambled up the bank and shoved a few corms into the earth, establishing a colony that has simply grown and grown. However they came about, I am very grateful. I search for them in the winter, once the Christmas tree is down and all the lights of the holidays are behind us, eager to look to the next indication that this dark winter won’t last. The road curves gently this way and that, so the aconites can only be seen briefly, from one particular stretch, and only if you are travelling south on the road. When I can’t find them I begin to wonder if they are not where I remember them, if I have confused my landmarks, or if for some terrible unknown reason they aren’t coming back, but I keep looking. And today I saw them. They are still in bud, so I am yet to see the full glorious pool of captured sunlight that they will become. Even in bud they make my heart jump, because they are already beautiful, and because of the promise of what is to come. They are mostly in shade, although they create their own light with their intense, joyful yellow colouring. When the low winter sun strikes them however, they glow, with an intensity that seems not only visual, but almost audible, like a clear ringing bell. I pass this way fairly often, a few times a week in the natural course of things. The next few weeks will see me coming this way a lot more, making up excuses and taking detours just to get a chance to have that golden sight a few more times.